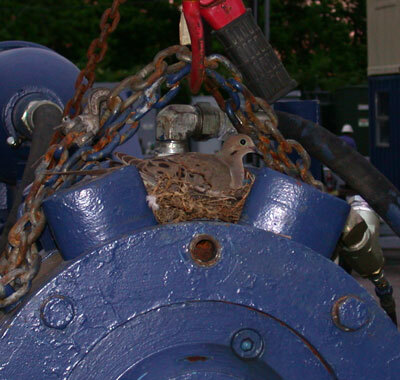 It is illegal to disturb an active nest, even if it is in an inconvenient location (like this morning dove nest on construction equipment), without a permit from the U.S. FWS and sometimes from the State also. Permits are seldom granted. Many people do not know that the Migratory Bird Treaty Act makes it illegal to disturb the nest any native bird without a permit (see exceptions). It is illegal to transport, trap or kill native non-game adult birds like Blue Jays or Mockingbirds without a permit, even if they are harassing birds at nestboxes or feeders. Despite the title, the Act protects birds that are not considered "migratory" (like Mourning Doves and Chickadees). I am not an attorney, nor do I play one on TV. Each bluebird monitor is responsible for becoming familiar with and complying with all applicable laws. The Bluebird Monitor's Guide notes that you do not need a permit from the U.S. Fish & Wildlife Service "to manage nestboxes with active nests when you are doing it for the welfare of the birds." You are allowed to remove and destroy old, inactive nests, because bluebird trail monitors are usually considered Good Samaritans. (A nest can be considered inactive if all the young have fledged or died, it has definitely been abandoned, or it has been destroyed by predators.) If you manage a trail, it is a good idea to contact your local and state officials and let them know in advance of your activities. Technically, you should not transport orphaned eggs or nestlings, touch adults or young, or bring an injured bird home to help it - only a licensed wildlife rehabber can do that. for some captive-bred birds like mallards. Under U.S. federal law, House Sparrow nests, eggs, young, and adults may be legally removed or destroyed. State or local laws may vary. It is better to have no box at all than to allow House Sparrows to reproduce in one. However, you MUST positively identify the House Sparrow nest/eggs/young/adults BEFORE removing or destroying them. It is legal to catch and immediately release a bird trapped in a building. Exceptions may be made when huge flocks of birds constitute a major nuisance or cause severe damage to agriculture. The US Fish and Wildlife Services can issue a "Migratory Bird Depredation Permit" in special circumstances for "activities necessary to provide for human health and safety, protect personal property, or allow resolution of other injury to people or property. No permit is required merely to scare or herd depredating migratory birds other than endangered or threatened species and bald or golden eagles. A depredation permit is intended to provide short-term relief from migratory bird depredation until long-term measures can be implemented to reduce or eliminate the depredation problem through nonlethal control techniques." An application must include a recommendation from the U.S. Department of Agriculture, Animal and Plant Health Inspection Service, Wildlife Services, for addressing the depredation problem. There is an exception in some areas where cowbirds are threatening populations of endangered songbirds. See Texas Law: Chapter 64.002. PROTECTION OF NONGAME BIRDS. After landowners are certified through a Texas parks and Wildlife free training program, they may trap and humanely euthanize female cowbirds from March 1 through May 31 only. Empty House Wren nests (sticks only without a nest cup or eggs) made by male House Wrens can be removed. Licensed bird banders are allowed to handle birds and nestlings for the purpose of banding only. The U.S. Fish & Wildlife Service is responsible for administering this Act. While the law is not often enforced, penalties are severe - up to six months in jail and a fine of up to $15,000. Equipment used to pursue, hunt or trap can also be seized. Before this law was passed, hunting of non-game birds was basically unregulated. 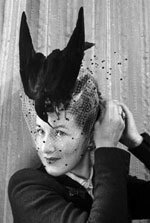 Native birds like Bobolinks and Cedar Waxings were apparently served in restaurants, and stuffed birds adorned hats. Egg collecting was a popular hobby. Ornithologists targeted rare birds like the Ivory-billed Woodpecker to add to their collections. Then people, including sportsmen, became concerned about wholesale slaughter of certain species. This prompted passage of the Migratory Bird Treaty Act in 1918. I found an egg - can I try to incubate it? Note: This information is specific to the U.S. Laws in other countries vary. For example, in England, under the Wildlife & Countryside Act 1981, all birds and their nests, whilst in use or being built, are protected and can not be destroyed or the eggs / nestlings interfered with unless certain conditions apply and then only once a licence has been granted by the licensing section of the Government Department for Environment Food & Rural Affairs (DEFRA / AHVLA). The passenger pigeon needs no protection. Wonderfully prolific, having the vast forests of the North as its breeding grounds, traveling hundreds of miles in search of food, it is here today and elsewhere tomorrow, and no ordinary destruction can lessen them, or be missed from the myriads that are yearly produced.